Disaster preparedness is a click away with this 84 servings Breakfast, Lunch, and Dinner Bucket. When you buy this disaster-ready food storage supply, you get four weeks’ worth of dehydrated breakfast, lunch, and dinner meals for one person or two weeks for two people. All you have to do is add boiling water and these meals are ready to eat. Best of all, this entire preparedness food package comes packed in one handy bucket, allowing your food storage to fit almost anywhere. All entrees are carefully sealed in nitrogen flushed Mylar pouches to lock in the natural flavors and nutrients to ensure you get a high quality, healthy meal. Pouches are then packed inside a durable Polyethylene bucket equipped with grab-n-go handles so they won’t ever slow you down. The 25 year shelf life ensures a long term peace of mind. 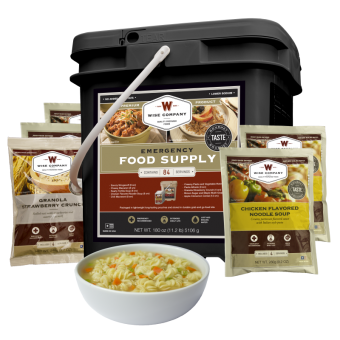 Wise foods are an excellent option for those wishing to be prepared to provide for themselves or their families in times of an emergency. The Wise Food Company's dedication to quality ensures a safe, nutritious product that will be there when you need it.